Calvin arrived at our RV door about 8:30 am on a Thursday, March 16, 2017 and installed our new shades, as he had told us he would do Wednesday evening. Kathi paid our bill and we were on the road to Thackerville by 11:00 am. We left the MCD factory in McKinney and drove north on US 75 to Sherman, then west on US 82 to Gainesville, then north on I-35 to Thackerville. We were checked in at The Winstar World RV Park and were in the casino by 1:30 pm. We spent several hours in the casino, mostly in the Vienna section where Kathi’s favorite Hot Shots machines are located. After some time in Vienna, we moved north and east playing machines in Paris, Beijing and Rome, before arriving at Madrid, which is a ½ mile walk from Vienna. We stopped at the pizzeria for some hot slices of pizza. I had a slice of pepperoni and a slice of combination pizza, Kathi had the combination, then we played a few slot machines in Madrid before playing our way back ½ mile to Vienna near where our car was parked. We were home by 8:00 pm and worn out from the day of excitement. We watched some of the TV news before falling asleep. 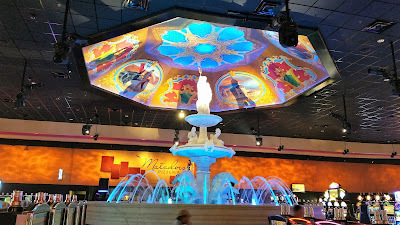 Fountain and ceiling decoration in Madrid section of the casino. Matador Pizzeria in the background. 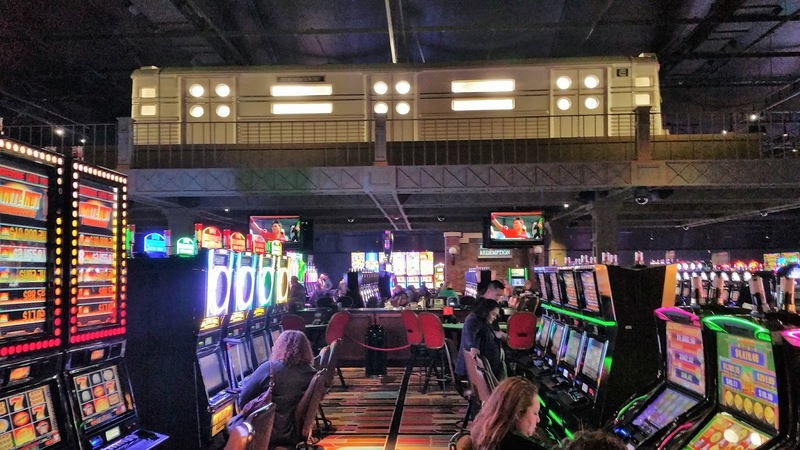 We slept late Friday morning and I took Kathi to the casino and I stayed home to write for a little while. I got a couple of Chapters written for my book, Memories of Larry, before I started getting hungry. I went over and found Kathi at Hot Shots in Vienna and sat down with her to play for a time, before lunch. She had a ticket for two meals at the buffet and I thought it was in the New York section of the casino. We walked south through Cairo into New York and no buffet. I inquired and found out the buffet was in London, a mile walk in the other direction. We changed our plans and went into the NYC Deli where we had eaten Nathan’s hot dogs on several previous occasions. This time they had added a steak finger basket to their menu. We gave it a try and both of us enjoyed the steak fingers, gravy and French fries. An elevated train car above the gambling area of the New York portion of the casino. 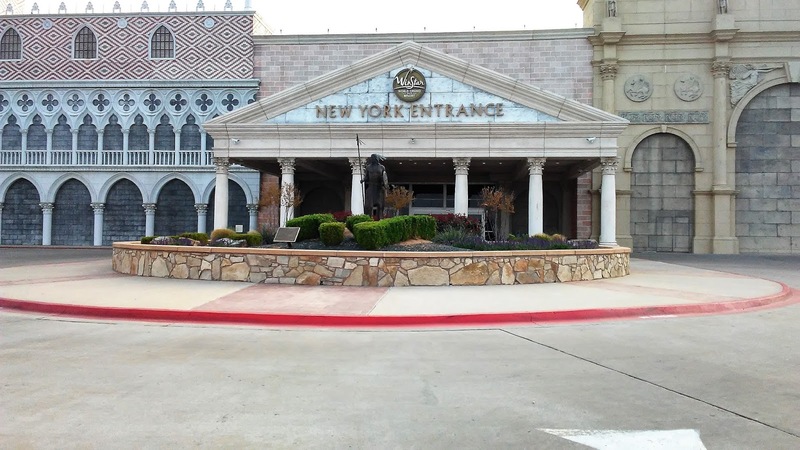 We decided to use our coupon for breakfast at the buffet on Saturday morning, then get our RV and head south to get half way to Georgetown and find an RV park, making two short drives instead of one long drive on Sunday. We found the buffet and it did not open for breakfast. We played a few machines in London that were not much fun and then tried some Cairo machines and ditto, not much fun. I looked at my phone to get the time and it was 10:50. We went to the buffet for lunch and we were both glad we had free meals. Their price was $17 each and the food was not worth that price to us. I took Kathi back to Hot Shots and we settled in for a few hours, before drifting. Our funds were up and down all day, then Kathi found a Carnival machine with a nice Jester that got us back to even. 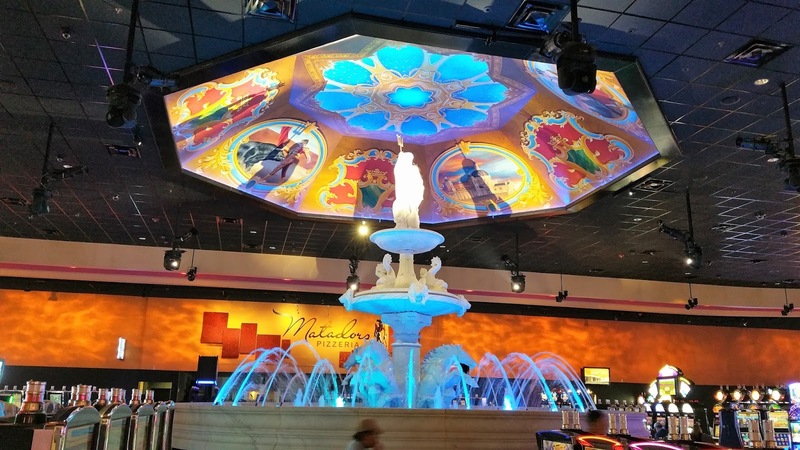 A little more casino fun and bed by 8:00 pm, to close out Saturday. Sunday, we drove to Lake Georgetown on I-35. There was a lot of traffic going our way when we left Oklahoma and most of the traffic dropped off when I-35 separated to I-35E and I-35W. Dallas must have a lot of gamblers that drive to Oklahoma on weekends. We stayed on I-35W and had construction from Fort Worth most of the way until Waco. We were bumper to bumper for many of those miles. The saving grace was the wildflowers. 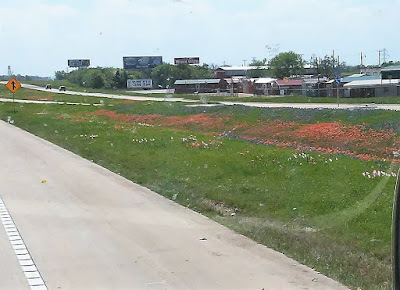 We saw a few pink buttercups, some new growth bluebonnets that looked like ground cover and a lot of Indian paintbrush that added color to the drive. 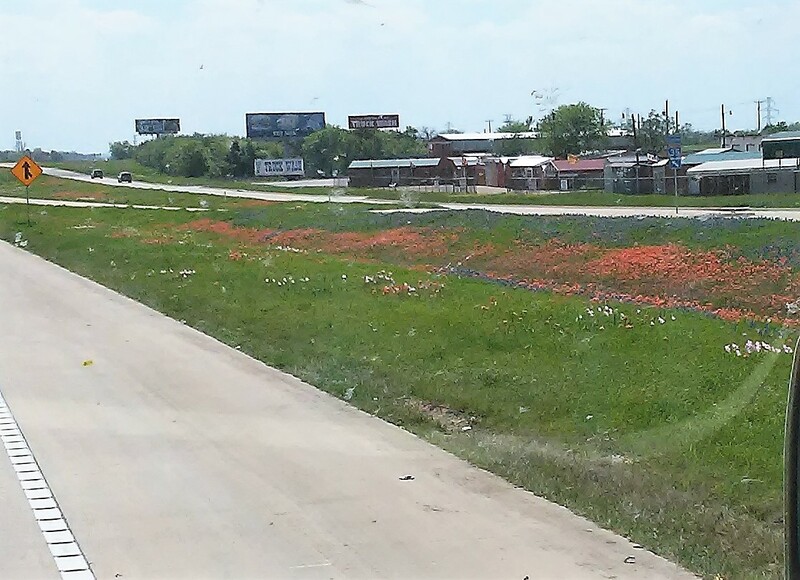 It looked like someone drove down the highway throwing Indian paintbrush seed out of their car window. We thank them for it. New shades, a short casino trip and on to see our son, AJ in Austin from our base camp on Lake Georgetown. We will spend ten days here, then make our way to Sunset, UT for RV repairs. We spent two years in Houston where we needed to be and now it is really great to be traveling again.